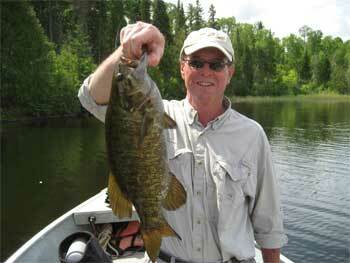 This section will take you through the seasonal movements of Smallmouth Bass at Fireside Lodge in Northwest, Ontario, Canada and also the techniques, presentations, and lure / fly suggestions, which have worked with consistency. The seasonal movements will be over a 12 month period for educational purposes, but keep in mind that Fireside Lodge open season is from the third Saturday in May through the second Saturday in September. With this in mind the techniques, presentations, and lures used will, in most cases, be for the open season at Fireside Lodge. The main bait fish and food supply in Little Vermilion Lake System is many different minnows, crayfish, leeches, perch, white sucker, whitefish, and cisco. Please email me with any questions. Pre Spawn Period: Ice out to actual spawn. Time period is somewhere between the first and second week in June, however this can vary by a week on either side. At the beginning of this period the Smallmouth are just coming out of the winter depths they reside in, which is 25 to 40 feet of water around main lake structures. 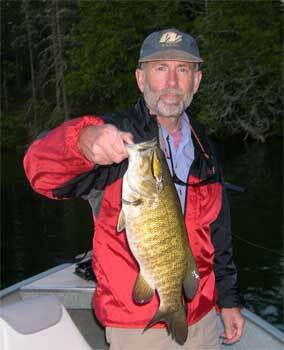 Usually by the time we open at Fireside Lodge the Smallmouth are moving up on main lake points and rock reefs. These locations give Smallies their three basic needs at this time of food, cover, and positions them closer to their spawning grounds. 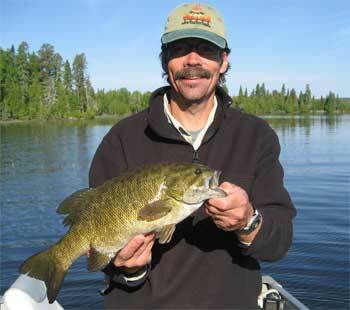 This is a fun time period catching Smallmouth, and a variety of presentations and lures can be used. Crank baits, twitching baits, soft plastics, in-line spinners, and jigs can all be used with great success. For fly fishers a sinking presentation would be best with minnow, crayfish, or insect patterns. The presentations vary anywhere from erratic twitching, to a do nothing approach. The key for success for any fisher-person during this time period is flexibility, as the Smallmouth habits can change quickly, so adaptation to these changes is a key. Any Fireside Lodge guest can be assured of getting the most up to date information at our in- house tackle shop. Fishing at this time can produce many fish and a lot of very large fish, full of spawn and feeding aggressively at times, especially if the weather stays consistent. 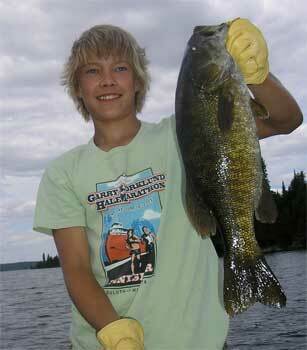 Spawn Period: The Smallmouth spawn occurs during the firs two in weeks in June give or take a week. This just depends on water temperatures attaining about 56 degrees Fahrenheit a few feet down. This of course fluctuates from year to year. The location of the yearly ritual takes place along hard bottom areas with a mixture of sand, rock, boulders, then add some fallen and overhanging wood and you have a perfect spawning ground. Little Vermilion Lake System is full of these areas, which explains why we have such a fabulous Smallmouth population. When the act of spawning actually takes place most of the lake population can spawn literally over night. Some areas will lag if they have exposure to the colder main lake body of water, as others will be ahead if they are in a secluded bay with darker bottom. 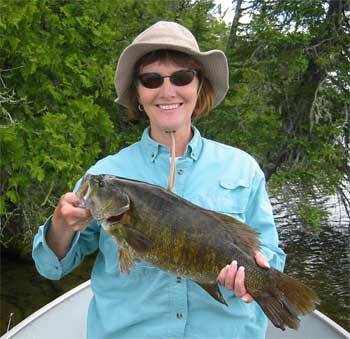 After Smallies spawn the female retreat to slightly deeper water to nearby structure, or depth change. The females will rest and slowly feed to re-gain strength. The males stay with the nest guarding the eggs, until they hatch, and will stick around until the fry consumes its yolk sack, and then will even lead the hundreds of fry to some nearby cover. At this stage the Smallmouth fry have to fend for themselves. 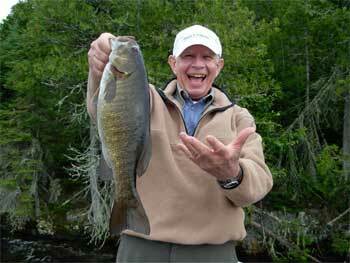 When fishing for Smallmouth at Fireside Lodge during this time period you are concentrating your efforts along shorelines with bottom type described above, and using casting and jigging techniques. 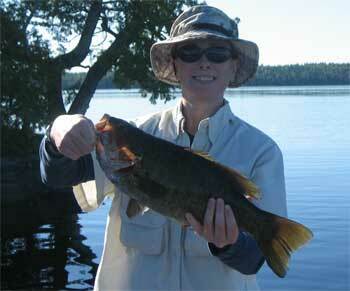 Type of lures can vary from crank baits, to twitching baits, soft plastics and a variety of jigs. Also, top water action can be great at times along with fly-fishing techniques. Flies can be of many types and patterns representing a nymph, crayfish, minnow, leech, and small poppers. Remember when selecting lures or flies the male fish you are targeting on the spawning beds are attacking the lures / flies trying to protect it�? ?s eggs or fry not actually foraging. 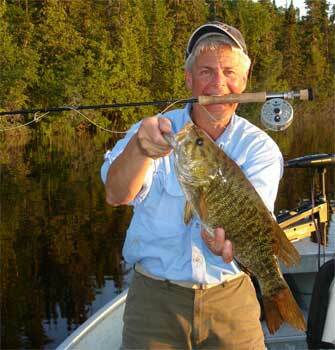 A few days after the spawn takes place the presentation should be slower and paused as the longer you keep your lure / fly in the area the more apt the Smallmouth will attack. A fast moving lure / fly will often be ignored after the first few days of guarding nests. The action at this time can be fast and furious. Expect to catch a lot of males in the 14 to 18 inch class, unless you pursue those more finicky trophy females. The choice is all yours. Attention!!! All fishers fishing for Smallmouth Bass while spawning should remember that this is a delicate time period, and can affect the year�? ?s recruitment or year class. Whenever fishing for Smallmouth at this time several responsible actions should be taken by all fisherpersons based on the facts that are listed below. 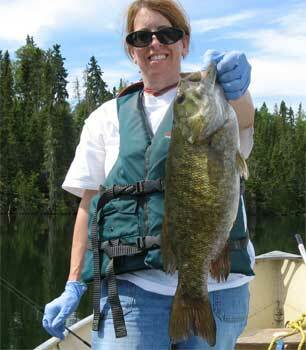 3) Nest failure can happen if Smallmouth are not returned within a minute or two of catching the fish. 5) If the wind blows you away from the nest while catching a Smallmouth Bass, nest success is better if you can go back to nest area to release the Smallmouth. 6) Fish in different areas during this time period as you will be catching the same fish if you return to the same areas, and every time the same fish protecting a nest is caught, the chances of nest survival decrease. Post Spawn Period: During this time period male Smallmouth Bass are finished guarding their nests and the females are recovered from the stress of the spawn. Both are on the move leaving the spawning areas and moving to their summer grounds, first stop being rocky main lake points and then towards off shore reefs. 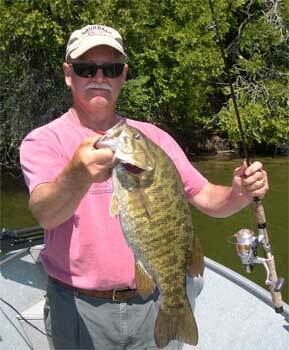 At this time the smaller, 8 to 12 inches, Smallmouth will be heavy on the rocky shorelines and feeding aggressively. Expect a lot of fast action and fun on these scrappers. The larger Smallmouth, 13 inches up to the 20 plus inch trophies, are in a neutral feeding mood, and while in this transition they are more of a challenge. Good news is, this only lasts about a week or less, occurs normally the third or fourth week in June, and can vary by a week either way. 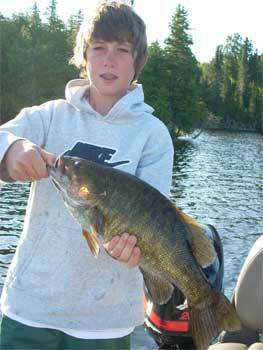 The advantage of having 5 Smallmouth Lakes, as Little Vermilion Lake system does, is that each lake is different, has slightly different water temperatures so the seasonal movements will happen at slightly different times. So when one lake is in post spawn, another two may still be in the spawn period, or starting the summer period. Fishing at this time is on and off for larger Smallmouth, requiring a slower presentation most of the time, and using smaller baits. Jigs, plastics, live bait, and small in line spinners are best. For fly fishers slow sinking presentation is best and smaller flies are best, representing a nymph mayfly pattern, or a leech pattern. Don�? ?t forget the poppers for those aggressive shoreline Bass. There is a good opportunity to catch bigger females at this time as they are fully recovered from the spawn, being that they do not guard the nests, and more apt to forage when found during this transition period. Summer Early Period: This I refer to as the flipping the switch period. After coming off the sluggish week or less of the post spawn period, the sizable Smallmouth Bass have established there early Summer locations, concentrating around main lake points leading into bays with developing weed growth, and off shore reefs and rock structures, some having pockets of weeds between the saddles, and between the structure and shorelines. Somewhere between the first and fourth of July, almost as if planned to coincide with the fireworks displays in both Canada and the USA, the Smallmouth switch is flipped and they start to feed very aggressively. This is fabulous fun for any angler as most any methods work, if properly presented in the correct locations. Crank baits, jerk baits, twitching baits, in-line spinners, soft plastics, and jigs, live bait and surface baits all work very well. Presentations will vary from fast to slower depending on the feeding mood at the time, but fish are almost always agreeable. For Fly-fishing, nymphs, woolly buggers, steamers, crayfish and leech imitators, and poppers all work. Expect fast action and fun for all sizes; with the smaller to medium size Smallmouth also being near any rocky shoreline with some gradual declining depth. During this period fish are easy locate with good lake maps and the instruction you will receive at our in house tackle shop. Summer Period: This period starts about the third to fourth week in July until the latter part of August weather depending. 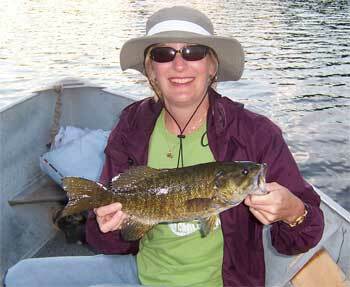 Smallmouth Bass are still located in the same areas as the Summer Early Period and all can enjoy fast action in these same areas. However, with weed beds being almost fully developed a lot of baitfish and aquatic food colonies move into and around these weeds for cover and food, and the �? 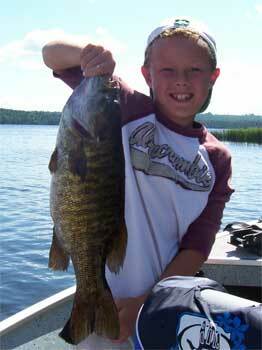 ?BIG�?� Smallmouth population starts to move into these areas to take advantage of this time of plenty. 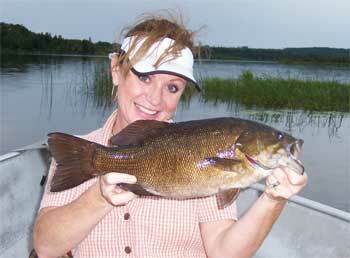 I have found over the years that a lot of Smallmouth fishers don�? ?t associate Smallmouth with weeds, and have been missing this opportunity. This can be the time to catch large numbers of BIG Smallmouth as they congregate in these areas, put on the feedbags and body weight, preparing for the upcoming cool and cold water periods. The bigger the weed bed the better the potential, but weed beds, which have good depth and lead into deep water are the best. Optimal fishing depths range from 6 to 14 ft; presentations vary from very slow and meticulous, to aggressively working surface baits. Most productive lures around the weed beds are jigs, soft plastics, twitching minnow baits, surface baits, and live bait or live bait imitators. Fly Fishing techniques in these areas vary from slow sinking methods to aggressive surface popping. Use Leech, crayfish, or minnow patterns and for surface fishing poppers, divers, and gurglers. At this time of year a lot of HUGE Smallmouth are caught, and some of the biggest Bronze Backs of the year will be landed. During this period fish are easily located with good lake maps and the instruction you will receive at our in-house tackle shop. Summer End / Fall Period: This period takes place towards the last few days in August to the later part of September. A slight transition starts to take place and Smallmouth can still be caught in a lot of the same areas with the same lures and flies as the Summer Early and Summer time periods. As this time period progresses main lake points leading into bays, shorelines with ledges leading into deep water, and reefs around deep water become more important. As the cooler nighttime temperatures cools the water, the presentations become more subtle. Techniques using paused or stop and go actions and jigging techniques work very well. Live bait and live bait imitators in soft plastics also work very well. Slow sinking flies of similar patterns mentioned in the Summer Periods work well for Fly Fishers. Fish are still feeding and establishing weight for the winter months just around the corner, but the cooler water is slowing their metabolism so adjustments mentioned above are important. A lot of fish are caught at this time and some of the biggest fish of the year are caught. The lure and flies used during the Summer period all apply with the top water production dropping off as the water temperatures decline, and the percentage of time using slower techniques increases. This is a fabulous time of year to fish having a slight visual and definitive smell of fall all around. Knowledge of the lake system during any time period is a key to success, and I am available in our in-house tackle shop ready to share my 22 years of experience to all Fireside Lodge guests. Fall / Late Fall Period: This takes place during the last week in September to ice up, which is normally between the second and third week in November. Even though we are closed at this time I thought I would include this period and the winter period just as a point of interest. By now the weed beds, so full of Smallmouth during the Summer and Summer End periods, are starting to die, and the Smallmouth are reversing their movements back to rock / reef structures, and main lake points having access to deeper water. As this period progresses and the water columns cool, the Smallmouth will make there way to select main lake and open water humps. These humps can top off anywhere from 15 to 20 feet and are medium size to very large areas. The humps will have some dispersed rock and boulders, dropping off into very deep water on all sides. Presentation is slow, small, and best to use lighter equipment. I have found the best lures are small jigs. A hair, maribou, tube, twister tail jig 1/8 to 1/4 oz are perfect, with a more vertical do-nothing technique. Live bait or imitators also works very well. Heavier jig weights are better for windy conditions. The hit you will feel is nothing more that a slight pull, and it almost feels like you are slowly hanging up on a rock. Even after setting the hook there is a moment of nothing, and then you feel the Smallmouth starting to slowly shake its head. After another moment or two the fish is fighting very hard and strong almost as if you woke the Smallmouth up. The times of activity are erratic however when the Smallmouth are active expect to catch many bigger to huge Smallmouth in one area. I have had times that seems unfair, almost like you are catching fish out of a barrel. Then there are the other times that humble us all. That�? ?s fishing! At this time the early bird does not get the worm. Best conditions are calm, and when the sun gets high in the sky. Because the areas you are fishing are susceptible to the wind, boat control and presentation are much easier in calm conditions, and the Smallies seem to get more active as the high sun warms the calm water. This is a very different way to pursue Smallmouth Bass and I wish I can introduce every Smallmouth fisher to this method, as it is a fabulous way to enjoy the late open water season right up to ice up. Winter / Spring Period: This time period is from about the second week in November when the lake completely ices over to the second week in May when the ice goes off the lake and the water is still very cold. I do not ice fish for Smallmouth Bass during the winter but through a very in-depth study I read, conducted by Dr Ridgeway in Southeast Ontario, Canada, I have some interesting facts to share. According to Dr Ridgeway the Smallmouth stay near the main lake and open water humps described in the Fall / Late Fall period above, living in 25 to 40 feet of water. They feed very seldom during this time period, which is why Smallmouth feed so much during the open water season, trying to build their body weight for the long winter months. Smallmouth fry have to reach a minimum length of 2.5 CM = 1 inch before the winter sets in or the chance of survival is slim. This becomes important in the far North as a very late spring and very late spawn, coupled with and early winter can eliminate a whole year class. That�? ?s why it is important that the spawning Smallmouth Bass, during the Spawn Period, mentioned above, need to be handled with care based on educative information. After the ice goes off the lake the same locations, presentations, and techniques are used as described in the Late Fall period until the water warms enough for this wonderful cycle of nature to take place again. 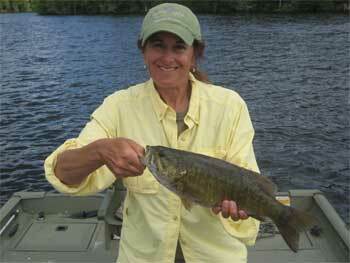 All Photos on this page are Smallmouth Bass that were caught and released by Fireside Lodge guests.